The first step to becoming a member of Holy Trinity is just to enjoy worshiping here. You might also begin to join in other aspects of Holy Trinity's community life and work. You are welcome, no matter who you are, to participate fully in Holy Trinity's worship, ministries and outreach. To see a schedule of services and all that is happening at Holy Trinity, you may visit the Weekly Notices posted on the parish website. If you would like to receive parish communications that will tell you about upcoming programs and events, you could complete a Visitor's Card. An online version is available below. Then, if you wish to make a fuller commitment to Christianity, you might wish consider baptism, or if you are already baptized, confirmation or reception into The Episcopal Church. 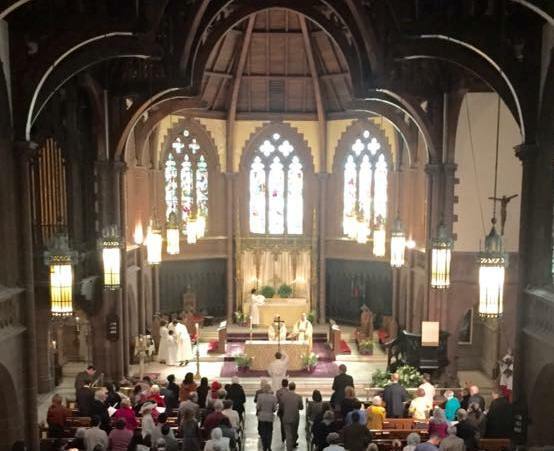 You may email your interest to ebrent@holytrinity-nyc.org, who will be very happy to answer questions and give you information about joining the Christian faith or The Episcopal Church. Finally, you may wish to pledge a certain amount of your income to Holy Trinity, as a sign of your recognition of the blessings of God and how you rely on God's gifts in every aspect of your life. You can make a pledge online at any time.